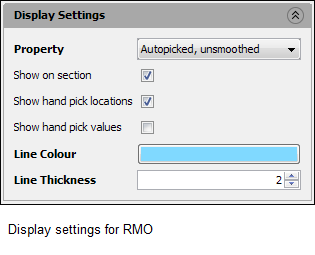 You can configure the display settings for the RMO picks in the Display Settings section in the Imaging tab. In the Control Panel, open the Imaging tab. In the Imaging tree, select the RMO item that you want to configure the display settings for. Property — Select the property of the RMO picks you want to display in all the views. Available options depend on the auto-picking and re-picking you have done with and/or without smoothing. Show on section — Select this check box to show the RMO vectors in the section view. Show hand pick locations — Select this check box to show the hand pick location in the map. In the Map View, the location of the hand-pick is marked by a square with the outline in the RMO pick colour. This setting is only available for horizon-based RMO picking. Show hand pick values — Select this check box to show the hand pick values in the map. This setting is only available for horizon-based RMO picking. Line Colour & Line Thickness — Click the colour box at Line Colour to select a line colour showing the RMO picks. Type or select the Line Thickness value that shows the RMO picks.